Nokia Symbian powered smartphone has been gradually stepping away from our eyes since the increasing popularity of Android and iPhone. What makes thing worse is that Nokia switched its own Symbian OS to Windows platform since the Microsoft's acquisition made by 2013. I have been playing around with my Nokia N70 for almost 4 years, the best selling device at the time it was announced. But now, it's the time for a change because of the lack of apps on Nokia Store. New emerging apps are consistently published on the market but seldom of them are available for Symbian OS. This is really disappointed as N70 user, and urged me to make the final decision. However, it's not an easy job to choose a proper one from so many options. Some of my friends recommended Samsung Galaxy series as a consideration. I did some research and finally agreed on the suggestion. Right now, I had a Samsung Galaxy S7 at hand, pretty satisfied with the large screen and pre-loaded interface. In order to make it work, the first step is to transfer my contacts from Nokia N70 to this device. Sadly, I had as many as 200+ contacts stored on my N70, It's a challenging task if I typed them manually onto my new device. Luckily enough, I found out a professional tool, named Androidsoft Phone Transfer that can easily handle this in a much more comfortable way. There is no manual work involved from the entire process. The software will cover all dirty tasks in the background. It takes only a few minutes to fully transfer all my contacts from Nokia to Samsung Galaxy. 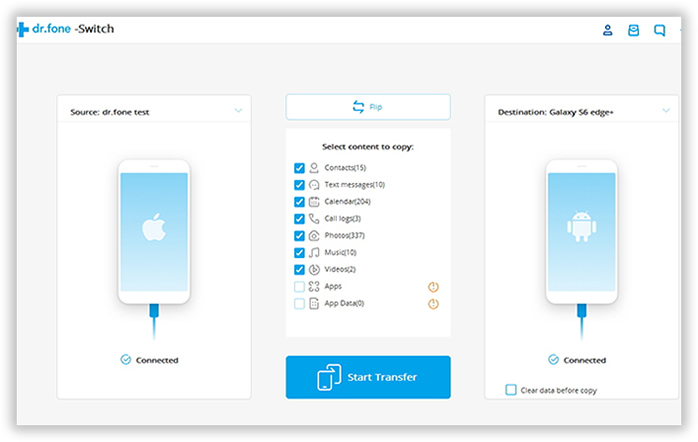 Besides contacts transfer, text messages, videos, music and photos are also transferred to the new device at the same time. Nokia Lumia, Nokia N series, E series and C series are well supported.. Note: The following tutorial only works for Nokia phones that are powered by Symbian, So if your phone was one of Nokia Lumia series, then please follow this guide to transfer contacts instead. The method is a bit different than the following, which is much easiser. You need to first sign in Microsoft account on Nokia Lumia phone, then backup the phone via Settings. Then export the contacts from Outlook and import them on Samaung Galaxy phones. The main panel summarizes the four patterns, with comments and considerations for new users. This article will give a detailed instruction so that new users can master it. In this tutorial, you should select "Switch" mode. Plug the Nokia phone on the PC via USB cable first, then Samsung Galaxy. Once both phones are well connected, the software detects them automatically and will analyze the contacts information stored on Nokia phone. After that, a list of items will be displayed on the center of the main screen. Flip the position is the source and destination phone is shown wrongly in order. Uncheck other items and leave Contacts checked. Then click Start Copy to begin the transfer process. It just takes a few minutes to complete the task; even the number is big enough. However, if you want to transfer other items at the same, check them all before transferring. Make sure both devices are connected during the copying time. 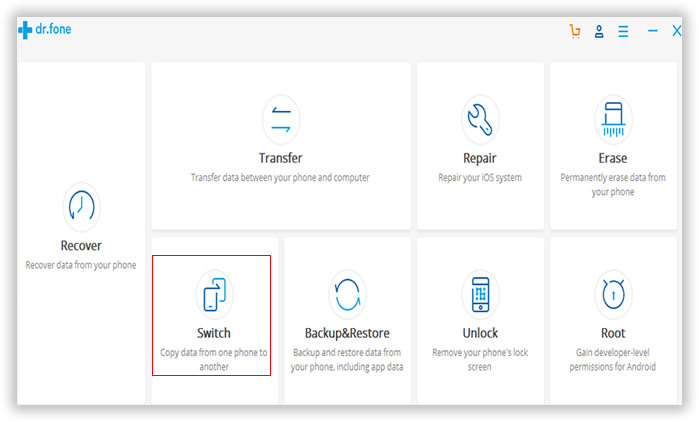 With this Phone to Phone Transfer at hand, there is no need to worry about the inconvenience when switching from one device to another, including Android and iOS. This intuitive user interface makes very easy to work with, no matter you are a beginner or computer guru. 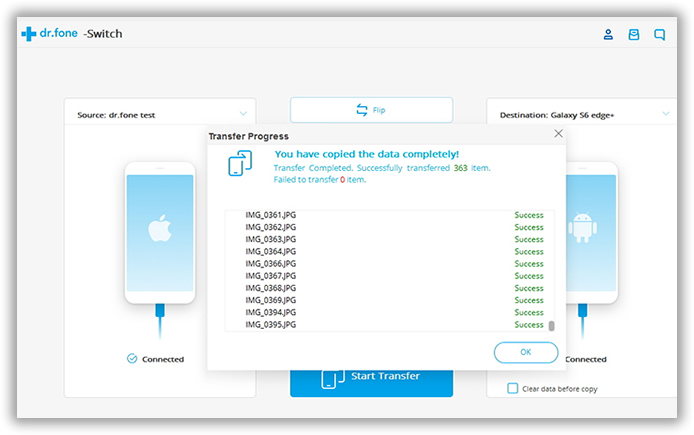 Also, no additional software is required to fulfill the transfer task. Personally, it's was the best phone to phone transfer and backup software sold on the market.